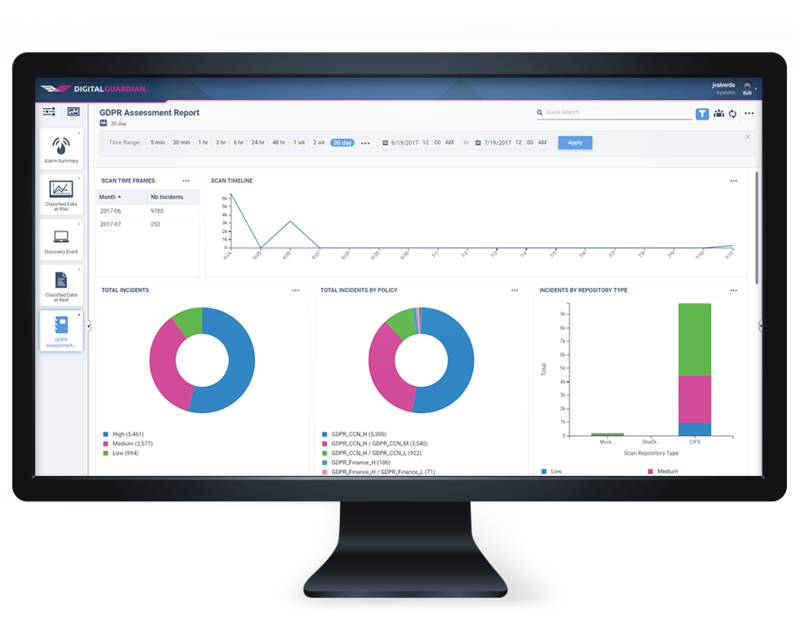 Digital Guardian for GDPR compliance combines data discovery, data classification and data loss prevention into a single, easy to manage appliance. Protect EU residents’ personal data at rest, in use and in motion with low overhead. The EU General Data Protection Regulation (GDPR) applies to any organization that processes and stores the personal data of EU citizens. With provisions including fines of up to 4% of global annual turnover or €20 million (whichever is higher) data protection compliance is now a board-level issue. GDPR comes into effect May 2018, which means that organizations must be preparing for compliance now. Digital Guardian’s industry-leading DLP offers network-based appliances that combine data discovery, data classification and data loss prevention in one powerful, easy-to-manage solution. We can automatically identify GDPR regulated data, which we can then protect in use, in transit and at rest. Digital Guardian’s powerful appliances are designed for quick installation and simplified management. Configuration wizards guide you through setup and configuration. Once deployed, our database record matching fingerprinting technology for identifying and controlling personal data is the industry’s most accurate, resulting in the lowest false positives. Digital Guardian for Compliance enables you to effectively discover, monitor and control EU personal data transmitted on the network, in use on workstations, or at rest in workstations, network servers and cloud storage. Digital Guardian analytics and reports can provide the key documentation to demonstrate GDPR compliance. Our enterprise wide reporting shows where EU personal data is located, how it’s used and what mechanisms you have in place to enforce GDPR data protection principles. Our controls operate silently until needed, then automatically respond to risky behavior. Employees are educated in real-time on the appropriate handling of GDPR-regulated data via display prompts that request justification for actions that put data at risk. Actions that violate data protection policy are blocked or contained before personal data gets out. This research report provides an introduction to the main characteristics of GDPR, and proposes technologies to consider in for GDPR compliance. While it is not a solution to the entire GDPR challenge, IDC thinks that DLP is core to much of the scope of GDPR. IDC’s Duncan Brown explains the practical steps security professionals can take to achieve GDPR compliance by the deadline.